The decision to come here was not an easy one. In Texas I had two jobs that covered my expenses, a comfortable home with loving parents, and good friends. Packing up only what I could fit in two suitcases and a backpack to leave all that behind and move to another state entirely was, frankly, terrifying. My mom drove me to the airport at 6 in the morning and I flew to Denver, dragged my 100 pounds of luggage through the airport, and took a four and a half hour shuttle drive to an address I had never seen, in a town I had never been to, to meet the almost stranger I had agreed to live with for the next year. Several times in the weeks leading up to that journey I wondered if I was making a huge mistake. But I took comfort in knowing that I could visit home, and my parents could visit me, and we were only ever a call or a click away. Full confession: I knew very little about either Colorado or Steamboat Springs when I made the decision to come. I saw the opportunity to work in a new museum without having to worry about affording a place to live, and to explore my faith and a new place at the same time. However, working at the Tread of Pioneers Museum, I quickly started learning about my new home. As a Texan, I found Western themes of ranching and pioneering comforting and familiar. But reading about the first families who decided to make their homes here, and the struggles they faced, made me begin seeing my own journey to get here differently. Altogether, my trip from Texas to Steamboat Springs took less than twelve hours. I arrived to a furnished home and a kind housemate who helped me with my bags and took no offense to me immediately taking a nap (in an already made bed!). In contrast, the first permanent settlers in Steamboat Springs, the Crawford family, arrived by covered wagon. The time between leaving their original home and setting up in Steamboat was three years. No house awaited them, only the Ute Native American tribe, who left the area in the winters. All they had to start a new life was what they were able to bring and what they could hunt or grow or find in the area. While I’m sure they left behind people who would have been willing to send them that warmer jacket that simply wouldn’t fit (thanks again mom! ), no post office yet existed. Someone else would have had to make their own difficult and dangerous journey to bring a piece of mail to the brand new settlement. These people were incredibly brave. The unknown they faced was a hundred times more daunting than what awaited me when I journeyed here. They arrived with very little and immediately began to create a home and a community. Without their choice and their commitment, I wouldn’t have the amazing opportunities that await me this year. As I settle into my new home and work to find my place in the communities of Steamboat Springs and Colorado ESC, I reflect on and am inspired by the courage of those who came before. Hi y’all. So this is my first blog post for the Colorado Episcopal Service Corps (CO ESC). First blog post ever really. I believe in transparency and honesty so I’m going to try not to filter myself much in these blog posts. With that said, I would like to ask three requests of you, the reader. One – please know that I acknowledge that I am still learning. My blog posts are going to largely be me describing the world as I see them. It will always be colored by the life I have lived so far. I think I have some pretty cool ideas sometimes and I also know that there may be some which I later look back on and think differently about after some time has passed. Some of these ideas will be half baked. Just a little secret – we’re all on a blog schedule that has already been set through next July so sometimes I might be putting hands to keyboard before I feel like the concept is solid in my mind. (If you know me, you know this is good, or else I would never post anything #PerfectionistLyfe).Things & perspectives change and that’s cool. Two – Please receive my words with grace. I ask that you try to give me the benefit of the doubt. Try on my thoughts, try to stand in my shoes when you read it, then form an opinion if you want. You don’t have to agree with my thoughts and feelings, but please try to lend some grace. Three – If I rub you wrong (or right really) in any kind of way and you want to chat about it, please find me on social media and let’s chat about it! Okay, now on to the real meat of the post. I came into this year excited to do service because service ties to social justice in my experience. While I like the act of service, I like the spirit of social justice. What is social justice you ask? Well for time’s sake, Wikipedia defines it as “the concept of fair and just relation between the individual and society. This is measured by the explicit and tacit terms for the distribution of wealth, opportunities for personal activity and social privileges.” I love service because I know people have immediate needs and I feel that we should help with those if we have the capacity. I love social justice because I believe our world has systems in place, prejudices we might not even recognize, and uneven starting grounds. For all people to have the same opportunity and freedom, I believe some work needs to be done to even the playing field. As a white middle-class able girl from rural Indiana, I’ve been struggling with some of my own prejudices as I serve at Metro Caring this year. Part of me says “these people should have food!”, “these babies should not be hungry! !”, “this parent should be able to get a job so he/she/it/they can provide for the household!”, “there should be affordable housing! !” and the exclamations go on. Another part of me says “Do you really need thaaaat much food?”, “Maybe don’t act like that”, “Maybe don’t have a family if you can’t provide for them”, “Maybe move somewhere cheaper.” Some of you are probably hating me right now. Some of you might be thinking the same thing. Me too, trust me, me too. Hold that thought/ feeling. One of my absolute favorite podcasts is Sounds Good with Branden Harvey. This week I listened to the episode with Pantsuit Politics (look Branden & Pantsuit up (LIOB!)) and have to thank them for this week’s revelation. They discussed this idea of human agency. My takeaway from them was that they define it as “people having an ability to get themselves out of a situation.” The idea was talking about government involvement and government assistance to people. Some believe the government should be very involved. Some believe the government shouldn’t be involved. Merriam-Webster defines human agency as “the capacity, condition, or state of acting or of exerting power.” I’m service-heavy this year so I am seeing a lot of the fulfilling immediate needs. Metro Caring does focus on protecting the dignity of our participants (how we refer to our customers/clients). That means treating everyone with the utmost respect and offering them the opportunity to make choices for themselves. It’s beautiful. Ultimately, I’m still helping to pass out freebies. Depending on the day and my attitude, that can feel good or feel like our business is being taken advantage of in a bad way. (Dumb, dumb, I know – recognizing my bias). So, in the spirit of self-examination and examining my own bias, I’ve been retrospective about my life. I can’t help but think about the topic of confidence. Confident has NEVER been a word anyone used to describe me. It is an area I feel inadequate in and am self-conscious about (self-conscious about lacking confidence- redundant, I know – welcome to my brain and heart). In the past few weeks of moving here though, I have surprised myself many times. I find myself doing things that seem confident. For example, last weekend I went to a watching party at a bar to watch my alma mater’s football game and try to make friends. I went alone. Didn’t think much of it. Just knew I needed to make friends so I went. Then I walked into the dark bar and it hit me how alone I was. After shrugging off the guy hitting on me at the bar (eyerollllll, I’m on a mission dude), I realized everyone was with their own group. I needed somewhere to sit with my beer so I asked a group if I could join their booth. It ended up being a family. Not the best group to make friends with, but hey, I did it! It wasn’t what I hoped for, but I walked away with a story to laugh at myself and a little taller because I DID IT. I went to that game alone and survived. The real exciting piece of that is, it wasn’t a big deal to me until after I got there and realized I was alone. I didn’t think much of getting on the bus, navigating my new city, finding the bar, and going in there alone. A couple years ago, I would never have even thought of doing that. Let alone, asking a random group if I could join them. How did I get here?? Well… trial, error, necessity, and access I think. The defining moment for me was that I used to have a very confident friend. He would lead me into new spaces, new learning experiences, cool places, and adventures. I leaned on him to lead me to new experiences and to also help me interpret the world. There came a point though when he left. As he left me to experience my new city alone, he encouraged me to go kill it. I thought I would break and flounder if I was alone. There was a quiet faith from him though, that I could do this for myself and I didn’t need him to lead me. Now, a couple years later, I’m finding myself feel confident. I think that space allowed me some agency. Being on my own now, as I’ve made three moves to three different states in the past three years by myself, has enabled me to have agency. Mostly because I have been forced to, I have learned I have agency – that ability to get myself out of a situation. I’m sure this is a concept straight out of some parenting books, but I am so thankful for the freedom I have been given. The freedom to fail, struggle, get back up. I’ve grown more confident, which is an awesome awesome feeling. Agency, the ability to get myself up, is FREEING. It is why Metro Caring tries to preserve feelings of agency and dignity for their participants. Agency can be different for everyone though. In my case, I am very privileged and have a security net. I know if I fall too hard, I do have family & friends, who would help pick me up. Agency appeared in my life when some other things shrank away. It was always there, I just didn’t see it. Couldn’t see the forest through the trees. I truly believe everyone has something to offer. I believe that people have qualities in them that the world needs. So yes, they need to put those to use for the good of themselves and the world. I ALSO believe some barriers need to be removed and hearts need to be molded in order for agency to be a reality. So once again, it seems to be a balancing act to freedom for all. Balancing between love and truth, between agency and assistance, between service and social justice. The list goes on.. Thanks for reading. I hope you got something out of this post. I’ll work on making my thoughts more coherent & condensed. 😉 Peace and love y’all. How I sometimes feel so far this year. Haha Also balance. Over this last month I have experienced almost every feeling or emotion I could put to words at one time or another. From the lowest of lows to the highest of highs, navigating these emotions required patience. The patience it required was with myself. At work, it may be with myself, a client, boss or colleague. At home it could be with myself, or my roommates and at church it could be with myself or with God. There is one constant in all of these scenarios, myself. To be patient in any scenario is a choice, a choice to interact with a solution to many problems that arise from within. Perhaps you’re angry at someone, or frustrated at a colleague or boss, or you’re so frustrated with something you’ve read in the bible that you can’t think about anything else. All of these emotions come from within and patience comes from within as well. Being patient should be easy enough, shouldn’t it? In my experience cultivating patience is as much of a challenge, if not more challenging than being patient in a hectic situation or when you’re beating up on yourself for something silly. Maybe think about patience as a muscle, the more you work it out the stronger it gets…and as the old saying goes, practice makes perfect (but let’s be honest none of us will ever be perfect). What I love most about practicing patience is that the more I practice…the better I get, and the more available I am to be of help to others, which is part of what this year is all about. Steamboat ESC talked about liturgy for our Tuesday Formation, and I found it interesting that I heard the word thrown around a lot in my life but I never really knew what it meant. Liturgy is a particular form or way of worship in a church. I like to think of it as the flow of things. For example, some churches open with a worship band, enter a time of prayer, give the message, and then close with a last worship song. Some churches are more traditional and structured in their liturgy and some are more relaxed and flexible, depending on where you go. The diversity in churches always amazes me. After discussing all of this together, we took some time to stop and reflect. As I was journaling my thoughts, I thought about the liturgy of my daily life. My typical day basically looks like this: I wake up, take the bus to work, work, take the bus home, make some dinner, and then try to do something fun or relaxing. In the middle of those things, I text friends, check social media, and play with the kids at the Boys and Girls Club. It made me wonder, what does my liturgy, or flow of things, say about me? I think that how we spend our time reflects pieces of who we are. After taking the “phone a friend” option, and talking out how I felt, I realized that there is no “perfect” liturgy. There’s a diverse range of liturgies, all different and all (for the most part) good. I came to the conclusion that I think the flow of our lives should reflect God’s love for us. With that in mind, I have a challenge for you (and me). How does your personal liturgy, the flow of your life, reflect God’s love? I hope that you take the time to reflect on your life’s liturgy. It made me think about how I use my commute time, how I interact with others, and how much time I spend on social media. The Merriam-Webster Dictionary defines dignity as “the quality or state of being worthy, honored, or esteemed.” In my humble opinion, this definition of the word dignity needs a resurrection. We often use the word dignity as a synonym for pride or self-worth, as if dignity is something that depends on one’s ability to be self-sufficient and respectable. Our baptismal covenant as Episcopalians does not require that we only respect the dignity of the dignified, but of every human being. It’s one thing to say that you respect the dignity of everyone, but putting those words into action is something else entirely. When we think of words like worth, honor, and esteem those in political power, celebrities, or those well respected by society often come to mind. We then think of grand gestures and ceremonies to further communicate just how dignified these powerful people are. But I’m not so convinced that dignity for every human being starts with grand gestures, if it even uses them at all. Dignity for every human being starts by preparing small things with great love, as if you are preparing for Christ himself. 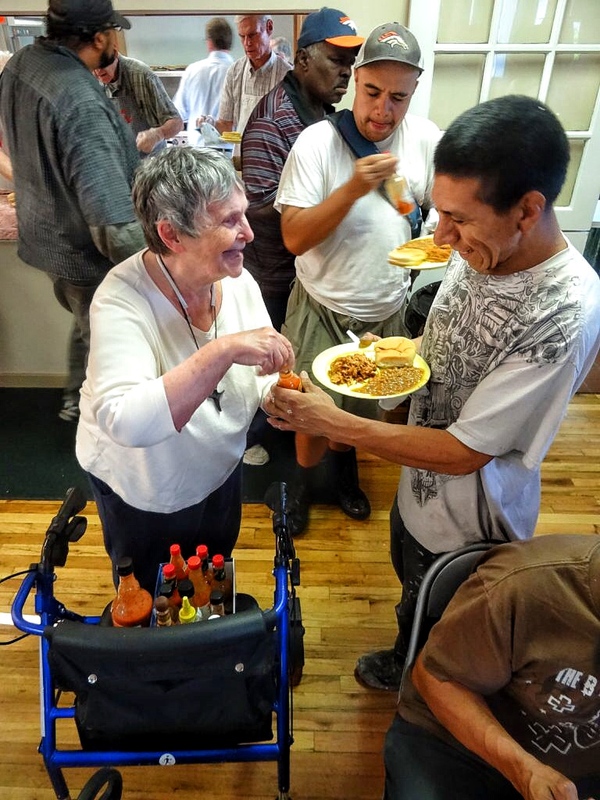 Every Tuesday, St. Clare’s Ministries (hosted by St. Peter & St. Mary Episcopal Church) hosts a community meal for upwards of 150 people experiencing a range of situations from homelessness to food insecurity. St. Clare’s also provides a store in which clients can shop for clothing, shoes, and sanitary products at no cost to them. In preparing these aspects of the ministry, it is a constant process to instill dignity in every aspect of that preparation. There is a world of difference between rack of shirts thrown together hurriedly than one that is organized and neat. There is a world of difference between a blank table than one that is set with a tablecloth and flowers. These small acts of love are what we can use to respect the dignity of every person we come into contact with in service. We can choose to do the bare minimum as if we are the only ones with dignity, or we can choose to take time to prepare for our beloved brothers and sisters. Having seen these decisions made on a daily basis by countless ministries, the choice is clear. Our clients, in the eyes of God, already exist in the quality or state of being worthy, honored, and esteemed. It is up to us to see what God sees and to act on that vision. I used to love color. I lived my life in bright colors and bold patterns. My childhood bedroom was painted teal and my bed had a bright orange comforter on it. Nothing matched, and I loved it. My room felt like a place where I could be joyful and silly, and my friends and I loved playing there. I used to wear sparkly nail polish. More often than not, it was themed around whatever season it was, or some upcoming holiday. I loved looking at my nails and seeing bright colors and being reminded to be happy and cheerful. I used to wear colorful clothes. In college, I had a pair of hot pink jeans. I loved those pants. They made me happy whenever I wore them, and I loved the idea that some of my brightness or happiness might rub off on someone else. Then we went on retreat. Call it divine intervention, fate, or sheer coincidence, but I ended up in a room with bottles of bright blue and purple nail polish and a few free minutes. Feeling comforted by the thought that I’d likely take the colors off my nails before being back in the “real world,” I painted my nails bright purple and blue. Confession: I was fully expecting to hate it. But shockingly, I didn’t. Every time I looked at my purple and blue nails, I felt a sense of joy and freedom. I loved seeing bright colors every time I looked down! And I felt a little like a rebel for wearing and enjoying something I felt so strongly I shouldn’t. I felt like me again. It wasn’t until I reflected over why something as simple as the color of my nails had such a profound affect on me that I recognized this lack of color in my life. I realized I’d grown comfortable, although somewhat bored, in my neutral world. My lack of color had spilled over into other aspects of my life. I stopped playing as much, or allowing myself to enjoy certain things I used to love just because I thought I had no room for those things in my life. I realized I had shrunk myself to fit into the box I thought I was expected to fit in. I had this whole idea in my head of how I thought my life was supposed to go – things I was supposed to and not supposed to do, ways I supposed to and not supposed to act. I realized I almost decided not to even do ESC because I somehow convinced myself it wasn’t the most “logical” thing for my future career development. And then I decided that I’m done trying to fit myself into that box. With my newfound confidence from my brightly colored nails, I did many more things on our retreat that I hadn’t done in a while. I wore a bright green (maybe yellow?) sweater, I sang out loud (in front of other people!! ), and I even made (and enjoyed making) a collage. Creativity has never been one of my strong suits, so the collage was a pretty big deal for me! I loved every minute of it. It was liberating! I realized I could be an adult and still enjoy my life! As I thought about my brief time in Colorado, I realized I’d actually played more over the past two weeks than I had in years. At the end of the retreat we listed personal goals and spiritual practices we wanted to include in our lives over the next year. I decided that one of my major personal goals was to get out of my perceived box. I’m done living my life based on how other people think I should act or dress or be. This year, I’m going to make laughter and play and color a spiritual practice. I’m going to go outside and play barefoot on the grass, I’m going to wear clothes with bold patterns, and make silly collages, and fill my life with all kinds of colors, and, of course, paint my nails bright purple and blue.